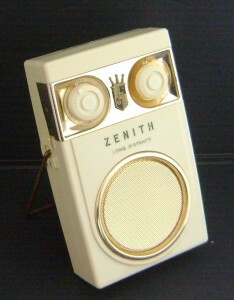 The Zenith Royal 500 was one of the longest running transistor radio series. It’s life spanned from it’s introduction in November of 1955 to it’s exit in 1965. During those 10 years, it went through 7 styling changes and several performance improvements. The first four styles were nicknamed “the owls” because their appearance resembles an owl at first glance. 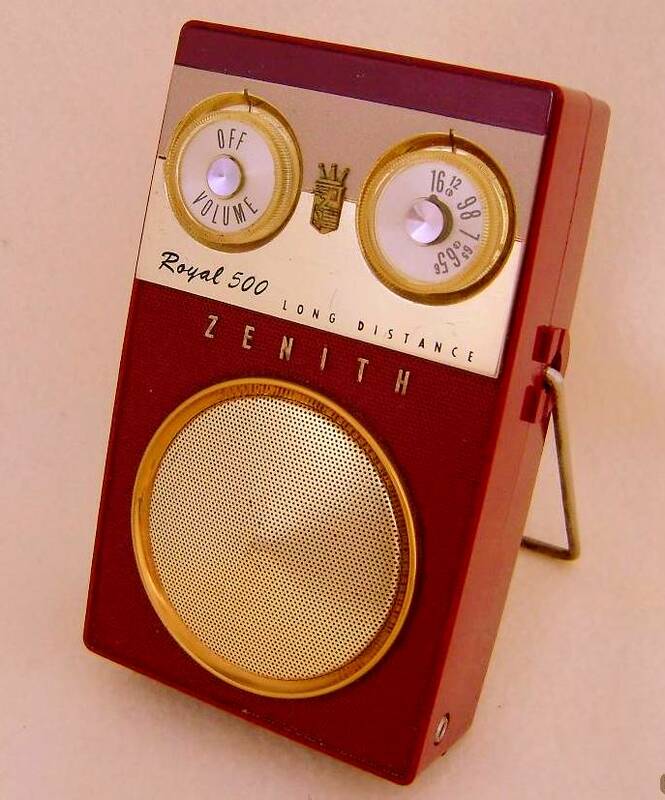 The Royal 500 represented the “top of the line” for Zenith pocket transistor radios and was extremely popular with the public. Their cabinets were made of an “unbreakable” nylon (instead of plastic) which allowed it to hold up better to use over the years. They were known for their superior performance and the early ones were powered by seven transistors when most other radios used only 4 or 5. These 500’s were designed to be powered by 4 inexpensive AA penlight cell batteries which made them economical to operate in comparison to other more expensive battery types of other radios. These were rather large pocket radios measuring 5.5″ high, 3.5″ wide, and 1.5″ deep and they weigh 15.5 ounces without batteries. Their initial purchase price in 1955 was high at $75.00 and the price remained that until 1959 when the price was reduced to $59.95. One of the nice features about collecting Zenith Royal 500’s is the fact that they all use penlight (AA) batteries that are easily found today and most still function well after almost 50 years. So you can still enjoy listening to them. Many other early transistor manufacturers used cells that are either expensive or obsolete today, or have “stopped working” so those radios now are good only for display. For the collectors who enjoy taking a step back in time while listening to their classic, I recommend that you choose a Zenith Royal 500. After all, why not get the top of the line? They are fairly easy to find in good operating condition and reletively inexpensive to obtain. An average example of most of these models can be found on ebay for between $30 – $60. In the pages that follow, I will share with you some of the examples I have been able to collect and the information I was able to gather about the Royal 500 line. Just click on one of the links below to start your tour. Once inside, remember to click on a photo to enlarge it, then click again to make it life sized. The Royal 500A (hand wired circuit board) – Introduced in November, 1955 About the first 100,000 units were hand crafted pieces of art. The Royal 500B (with printed circuit board) – Introduced in mid 1956 This allowed for faster production to keep up with demand. The Royal 500D – Introduced in 1958 An 8th transistor was added along with other chassis enhancements so was the Long Distance designation. Enhanced 500D – Late 1958 The grill changed from concave to convex to allow room for the new expanded range speaker. Royal 500E – Late 1959 A new look for the “Owl Eyes”. Same great long distance chassis, but these are hard to find in nice condition. The gold plating by the knobs did not hold up. The Royal 500H – 1961 This all new innovative transistor radio would set a whole new standard for performance. With an large expanded range speaker with an off-set coil was capable of producing crisp highs and deep lows for a listening experience not hear before in a pocket radio. Royal 500L- 1964 The Royal 500 Model L was introduced in 1964 and it was a real step backwards for the 500 series. Although still a sharp looking radio, the output fell back to 100 milliwatts, the speaker was reduced in size, and the quality of sound suffered. It sold for $39.95 and came in three colors: Black with a gold grill, white, and a few in green. The Royal 500NG – In 1965, the final chapter of the fabled Royal 500’s was written with the totally different model N-G. I don’t know why they named it that, but maybe because compared to the previous Royal 500’s, this one was Not Good. It was cheaply put together and performance took a big step backwards as the output was only half of the model H. Needless to say, this one is not sought after by collectors, except maybe as a filler to complete the 500 line. Sad way for this legendary product line to end. It did feature a lighted dial though by pressing the button on the lower right which was kind of nice. This marked the end of the Royal 500 series. If you haven’t seen this site check it out. Fascinating info on the 500’s. The pride of my collection is an early 500 s/n 25 thousand and change. I purchased it from the original owner. The interesting thing is both the knobs have the white triangle pointer. Based on the informartion found in the above site there are a few other construction anomalies as well. Shows Zenith was scrambling to produce these as fast as possible. I enjoyed your site. Nice job-keep collecting. Rob. I bought my royal 500 in 1959 and paid $75.00 for it! I am now 73 years old! I still have the leather case and it works well for its age! I have taken pictures of it and the leather case! But was curious of any value or color combinations as mine is two tone! I always removed the batteries when I stored so maybe that’s why it still works! I never realized how popular that radio was! Wa it made in Chicago? Thanks Rich! I received the Zenith 500 Royal earlier in the week. I cannot believe the beautiful condition of this 50 year old transistor radio!…..and I definitely cannot believe the sound quality. Thank you so much! I will buy my next transistor from you. Thanks again! Great sight Gary. 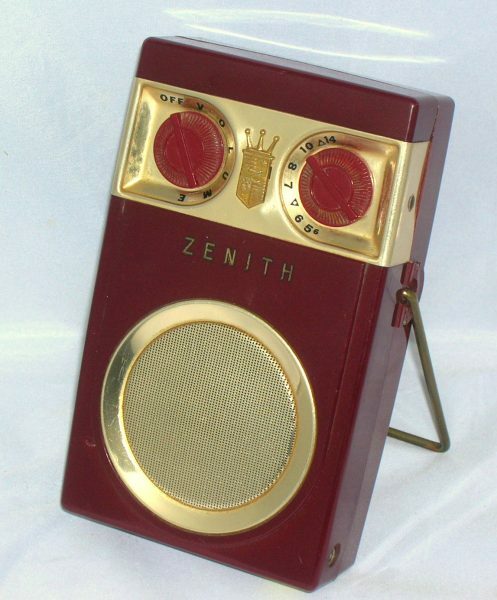 I began collecting Zenith Royal 500 radios several years ago and have not stopped yet. All play well and are in like new condition. The ones I received that were not playing well I had repaired by experts who know these radios. Nothing as great as listening to these old radios which I do every day. They pick up distant stations better than the full size radios. More plaudits for Norm Smith’s book on Zenith Transistor Radios. However he may have perpetuated the idea that the 7XT40Z and 7XT40Z1 were improvements on the original 7XT40 when I believe that the ‘Z’ was added to signify Raytheon transistors and the ‘Z1’ signified Texas Inst. transistors. That may be why there is no defineable serial number break for these other chassis numbers, they were used at any time during that first year of production when Sylvania transistors (less expensive) were unavailable. See McGarra’s website for more information. He has SN 506, a 7XT40Z and SN 1653, a 7XT40. I have number 2600 and 6270, both 7XT40. Are you the Flavoradio Collector? I’ve been hooked ever since i bought one 40 years ago for a canoe trip. It fell into a lake, and I let it dry in the sun. One day later it was as good as new. Well, Kind of . At least that’s how I remember it. One other thing, the longest running production of any one series of radios was the 30 year run of the Realistic Flavoradio. Of course, who cares (sniff). We all seem to be in the contest for lowest serial number, but perhaps the rarest of this breed are the crossover 500’s (500AB?) made during the change from the handwired chassis to the printed circuit type. These models have the vernier tuning and new knobs but are still on the steel handwired chassis. They seem to be scattered in the 90,000 to 120,000 serial numbers. They are easy to identify from the front because of the thin black station pointer (replaced on the printed circuit jobs with a wide white line. I wonder how many of these ‘hybrids’ were made? I just landed a burgundy 500 serial number 00491, all black rounded top Sylvania transistors, tuning cap dated 538, output transformer dated 544. See it under ebay completed auctions. Check oswegoradio.com for detail on Royal 500 #00016 and #00491. Did the serial numbering start over with the different design changes on the Royal 500 ?. I see a royal 500 with a sliderule dial called model Z. What can you tell me about it? Hi Gary, Just received a Royal 500H in very good shape. Yes, I can see why the old timers like this radio. It will go along side of my Royal 400, Royal 3000-1 and Royal 51. All of which are fun radios. Thanks for the great site and all the excellent information and links. Great site and i am a new collector of the Zenith 500. I just purchased a maroon one with the chassis number of 7zt40z1 for five bucks at a yard sale. It is in nice condition after I clean it up. Can you tell me about what year it was produced and any value? Robert, the Y is Zenith’s color code for black or ebony. I was given 2 Royal 500`s by my father-in-law that he received from his father-in-law. He was an engineer that was a specialist in transistors and worked for Zenith in Chicago. The story goes that his boss wanted a special case made for his wife, Chartreuse in color and so 1 was produced. It was presented to his wife and she did not like the color so it was returned and he decided to keep it. Just curious if you have ever come across a 500 that was this color and if this story is possibly true. Thanks. I can send a picture if you have an email. I do not see any contact info for you on the sight. Thanks. Brian, Please send pics to me at ballgandc@hotmail.com Thanks! Hi Ken, I assume that it all started with #00001 because I have seen #00046 and #00017. And these numbers stayed sequential on the Royal 500s until other models like the Royal 800 and Royal 300 were introduced in mid 1956 and 1957. I have a 500E-1 that was my grandparents. I am having it restored. It is not in the greatest of condition, but it holds many memories of my childhood and my time with my grandparents. My grandma was a diehard Mariner’s fan and we listened to the games when I would spend the weekends and long summer days at their house. So, my hope is to have it in working order to listen to the Seattle Mariner’s for many years to come. It was my first exposure to “rock and roll” on the old a.m. station 950 KJR. I ordered a case for it and replica batteries. Thank you for having the pieces to help me “relive” some of my childhood. Just discovered your excellent website , thank you. I started collecting transistor radios about 3 years ago . I have over 300 in my collection so far. I have only one 500 series zenith. It is maroon in color, “owl eyes” front. On the back of the radio it says Royal “500” DeLuxe and below that it says Tubeless-All Transistor. The radio is in excellent condition and does work ,picking up 8 or more stations. Can you possibly tell me what year it is and it’s value ? Thank you . Nice and informative website. I own a maroon 500D (I think), based on your photos. I still have the leather carrying case, although with a makeshift carrying handle. It belonged to my great grandfather, then grandfather, until it was passed along to me, in the late 70s. It had worked quite well, until I checked it after a cross-country move to Florida, and discovered the dreaded battery leak. I know. It messed up the earphone jack, and caused a couple wires to become unattached at the jack. I cleaned it up, the best I could, and was able to perform a couple of crude solder connections, and managed to get it working, again. I don’t think the earphone function works, any longer, however. Who does restore these? I don’t know how long my solder work will last, and wonder if the earphone jack could be repaired or replaced. I could send a couple of photos, if you’re interested. Thanks for your time. I just got a rebuilt model 500D last week and am really enjoying it. Wasn’t cheap, but great little radio that makes me want to collect an example of each version (except the last two). Getting this radio led me to your site and I like it very much! Hi Jason and welcome to the wonderful world of transistor radio collecting. When it comes to performance, most collectors agree that Zenith is on top. They were not cheap radios at all, and only the elite could afford them in the day. But now, anyone can get a nice affordable one (or more). Like your site. I just got back into collecting Royal 500s after unloading my entire collection a few years ago (more than 20). Now I’m picking some up but only the handwired ones and 500Bs. I find that after recapping them; they all need alignment. Somewhere I read that owners couldn’t resist turning the IF and OSC transformer cores in an effort to improve reception-very true statement. I have a few questions though-how does one remove scotch tape residue from the case without causing damage; though I find that a product I use to restore old telephones called “Glayzit” does a fabulous job of improving the appearance. In addition, I have a few radios which apparently have some sort of short or discontinuity in the tuning capacitor. In tube radios I usually remove the capacitor, apply high voltage and “spark” out whatever is causing the short-these variables are so small, I hesitate to try that! A Zenith Royal 500 Deluxe was given to me with a leather case. Case is in perfect condition. The radio didn’t work. The speaker is bad and I need a replacement. I installed a smaller speaker just to try the radio out. It plays great but limited on the volume because of the speaker. Do you know where I can get a speaker for my radio? I bought the handle from you because it was missing. Your website educated me on these great radios. Thanks! There also may be more than the speaker that keeps it from performing at peak volume. Its the 500 B. I replaced the caps. I found an after market speaker. Its a little bigger. I cut the magnet down and it fit perfectly. The radio sounds great! A friend of mine has a Zenith 500H speaker NOS. still in the original box never used. I think he may list it on ebay. What would be a good asking price? Thank you. Great website!! !